1. Potatoes must be cooked till soft all through. 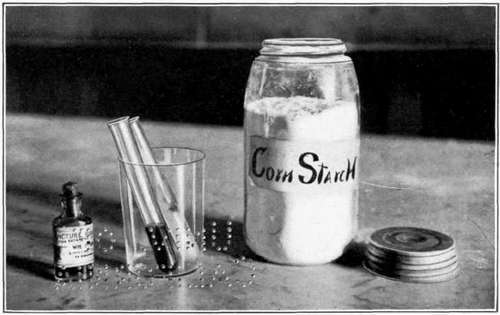 Hard compact granules of raw starch, enclosed by walls of woody fibre, are not easily acted upon by the digestive juices. The object of cooking potatoes is to soften and break open these cell-walls and to soften and swell the starch. 2. Rapidly boiling water wears off the outside of the potato before the middle is cooked. Let it bubble gently. 3. If the outside of large potatoes becomes soft while the centres are still hard, add one pint of cold water. Enough heat remains inside of the potatoes to finish cooking them. 5. Potatoes baked in a slow oven become dry and hard. Quickly baked potatoes are more easily digested than boiled potatoes; slowly baked ones, less so. 6. Unusually large potatoes may be halved for baking. Press boiled potatoes through a coarse strainer or a vegetable press into a hot dish. Beat all together until light and creamy. Heap in a dish without smoothing the top. 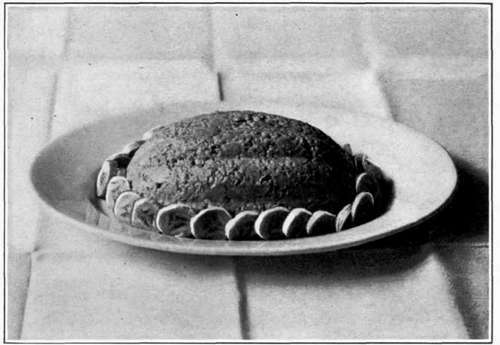 It may be put in a baking-dish, the top brushed with milk, and browned in a hot oven. Cut cold boiled potatoes into one-half inch cubes; put these into a saucepan, nearly cover them with milk, and cook gently until nearly all the milk is absorbed. Add white sauce, stir for one minute, sprinkle with finely cut parsley,1 and serve. 1 Many people prefer white pepper on potatoes, in white sauce, and in any other food where black pepper would show distinctly. Butter, 2 tb. Flour, 2 tb. Milk, 1 c.
Salt 1/2 t., Pepper, 1/8 t.
Rub flour and butter together with a spoon in a small saucepan. Add milk, and stir steadily over a moderate heat until the sauce boils. Add salt and pepper. For richer white sauce use part cream. Cream sauce is white sauce made with all cream instead of milk. Use one and one-half teaspoonfuls of flour to one cupful of cream. Sweet potatoes are best baked. If to be boiled, leave the skins on, pare after cooking, and dry for a few minutes in a moderate oven. They may be riced. Potatoes contain foodstuffs which meat lacks. Eaten with meat, they form an important article of diet, and one we do not tire of, particularly if they be cooked in a variety of ways. Sweet potatoes are more nutritious than white. They contain sugar in addition to the foodstuffs found in white potatoes. Pick off several sprigs; if wet, dry with a clean towel. Hold them in a firm bunch on a board or plate, and cut them through and through, repeating until very fine. 2 This recipe makes one cup of sauce, enough for four moderate-sized potatoes, or one pint of potato cubes. Cold Oatmeal molded and garnished with Sliced Bananas. Iodine Test for Starch. Diluted tincture of iodine in one test-tube, starch-paste stained by iodine in the other. U. S. Dept. of Agriculture : Farmers' Bulletins: 256. Preparation of vegetables for the table; 295. Potatoes and other root crops as food; 324. Sweet potatoes. Wiley: Foods and their adulteration. Pp. 288-305. Sherman : Food products. P. 319.